On an evocative concert trail, music and image drive, interrupt and contrast with each other. Double bass player Peter Jacquemyn enters into a dialogue with performance artist Sigrid Tanghe. Composer Annelies Van Parys was inspired by Luc Tuymans' Angel for a new work on a text by Gaea Schoeters. Cellist Arne Deforce and calligrapher Brody Neuenschwander close with an intriguing performance. Ivo van Hove directs Ed Lyon and Silvia de La Muela in Leoš Janáček 's The Diary of One who Disappeared. Annelies Van Parys composes an answer to this intriguing tale about detachment. Her collaboration with the librettist Jen Hadfield, scenarist Gaea Schoeters and director Tom Creed led to the creation of a pioneering opera that won several awards. Private View breaks with tradition, above all in the video installation by the Collective 33⅓. WHAT DOES IT MEAN TO LISTEN? AND HOW EXACTLY DO WE LISTEN? 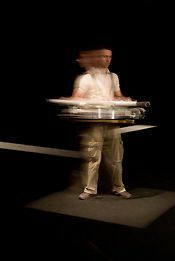 Aernoudt Jacobs is a sound artist and artistic director of Overtoon, a Brussels based sound art platform. Aernoudt Jacobs' work is both phenomenological and empirical. It originates from acoustic and technological research and investigates how sounds still can yield sonic processes which will trigger the perceptive scope of the observer. Jacobs' installations focus on a central question: how can the complexity, richness and stratification of our direct, daily environment be translated into something that can really be experienced? water surface by David Bowen is an installation that connects the gallery space to current conditions on the surface of the oceans all over the world. As wave levels and structures fluctuate in globally distant locations, the installation reflects this activity by creating continually varying three-dimensional patterns in a matrix of LED lights.